Magnetic imaging with polarized soft x-rays offers several advantages compared to other techniques, which are available to visualize magnetic structures and magnetic behavior on microscopic levels. The ultimate spatial resolution for soft x-ray techniques, i.e. the diffraction limit set by the wavelength, will be in the few nm regime. The temporal resolution, given by the length of a single x-ray pulse is at 3rd generation synchrotron sources in the sub 100 ps regime, but should reach out into the fs regime at next generation x-ray sources, where single shot imaging should become feasible due to a sufficiently large number of photons per single x-ray pulse. The interaction of polarized soft x-rays with magnetic (ferromagnetic and antiferromagnetic) materials exhibits for element specific photon energies, which correspond to inner core electron binding energies significant magnetic cross sections. These magnetic dichroism effects serve as magnetic contrast mechanism for imaging and give quantitative information about magnetic ground state properties, such as magnetic spin and orbital moments. A full 3 dimensional information, specifically access to magnetic structures at interfaces can be obtained by imaging under certain geometries, as well as from computational magnetic tomography of 2 dimensional projection images. 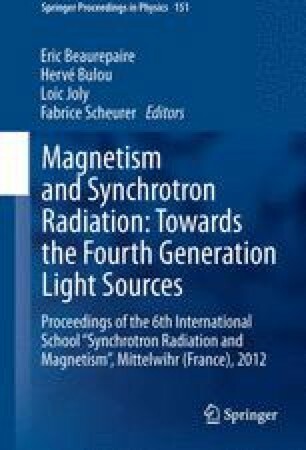 The author would like to thank all his colleagues, who contributed to the work presented here, in particular M.-Y. Im, W. Chao, and E.H. Anderson (CXRO), L. Bocklage, and G. Meier (U Hamburg), K. Yamada, K. Kobayashi, T. Ono (U Kyoto), T. Sato, Y. Nakatani (U Chofu), H. Kohno (U Osaka), A. Thiaville (U Paris-Sud) S. Kasai (NIMS Tsukuba), S.-K. Kim, H. Jung, D.-E. Jeong, Y.-S. Choi, Y.-S. Yu, D.S. Han (SNU, Seoul), K.-S. Lee (UNIST), C.S. Fadley, A. Gray, J. Kortright, and F. Hellman (MSD LBNL) and the staff of the ALS and CXRO for excellent support. This work was supported by the Director, Office of Science, Office of Basic Energy Sciences, Materials Sciences and Engineering Division, of the U.S. Department of Energy under Contract No. DE-AC02-05- CH11231.